Heat dutch oven on coals for Frying to about 375 degrees. Lift bacon out of dutch oven onto a paper towel. Cook chops for 5 minutes on each side. 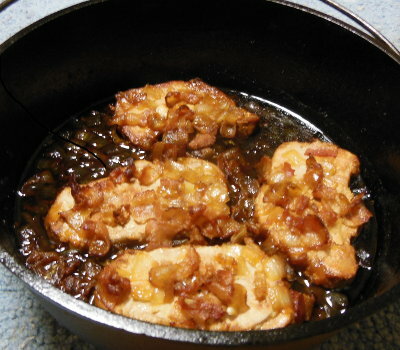 Place chops on a paper towel while you pour excess grease from dutch oven. Pour onion and garlic in dutch oven, and cook for 5 minutes. Place chops back in dutch oven. Mix soy sauce, honey, chili, and curry in a bowl, then pour over chops. Sprinkle bacon bits over chops. Put lid on dutch oven, heat to 350 degrees for Baking, and cook 25 minutes. Serve on rice or noodles for 6. Let me know how you enjoyed your Zingy Pork Chops!